First, for those in the Port Orchard area, the “Taste &See” ministry is a traveling ministry, going into the community with free coffee and donuts and other snacks to people on the move. Feel free to contact us so we can schedule service to your area, business, park and ride, etc. Secondly, we desire to provide to anyone in our community, or to those who visit us on the web, a friendly environment for you to ask questions and get information pertaining to spiritual issues. We provide free Bibles, tapes, CD’s, and thought provoking articles on the Bible or topics of spiritual interest to those who are sincerely interested. In this era of increasing spiritual confusion, many want to search for the truth without going into a church service, with all its trappings. In support of your search, we have several sections of the site dedicated to helping you draw closer to Jesus. We have hundreds of verse-by-verse Bible studies in MP3 format for free downloading. Additional studies are available on cassette tape. We also plan to dedicate a portion of our web page ministry to answering any questions you may have. We will post answers to your questions as we have time to respond. Please leave your question with us by clicking on the ask icon. We are also available to pray with those who may be suffering or wanting someone to provide comfort and listen. Please feel free to call us at our contact phone number. Some may wonder what we want from you? The answer is, nothing! 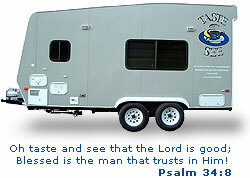 But we hope you will Taste&See that the Lord Jesus is good and that you will be blessed if you put your trust in Him. Calvary Church is a non-denominational congregation of believers in the Lord Jesus Christ.